Become a member of SARTS, the Society for the Arts in Religious and Theological Studies, for $60. The membership includes a subscription to ARTS. Graduate students and senior citizens can join for $25. Join SARTS as a Joint Member with another academic society. Members of Arts, Religion, Culture (ARC), the Association of Practical Theology (APT), Christians in the Visual Arts (CIVA), the College Theology Society (CTS) are invited to become a member of SARTS at a reduced "joint" rate of $30. We are actively seeking additional societies to participate in this program. 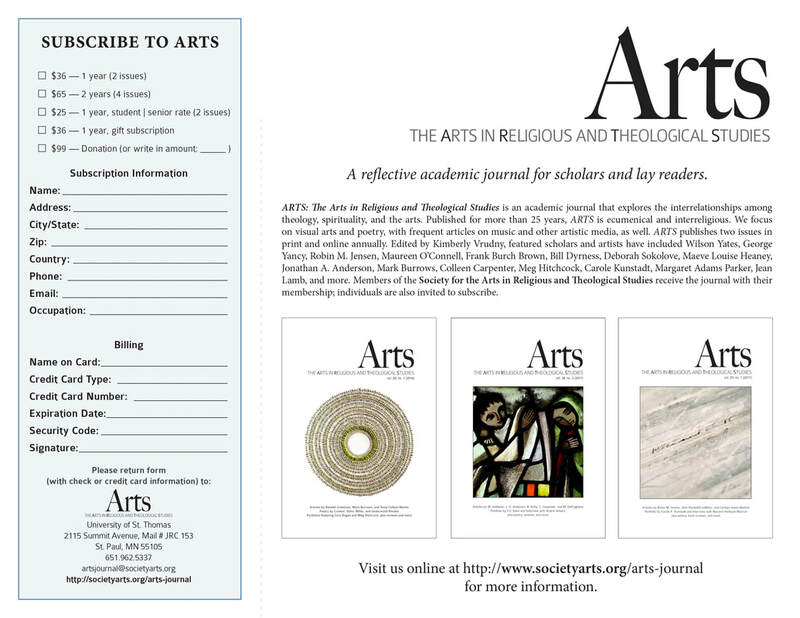 If you do not wish to become a member of the academic society but wish to receive the journal, subscribe to ARTS. One-year subscriptions are $36. Graduate students and senior citizens can subscribe for $25 using the "Join SARTS" button, above. Receive ARTS for a lifetime with a contribution of $600. ​Purchase ARTS as a gift. Give the gift of ARTS by giving a subscription to a friend, relative, or colleague. ARTS enters into partnerships with academic institutions and arts organizations that support the vision, mission, and publication of our academic journal. In exchange, partner institutions are invited to link to their pages in our email promotions and to advertise their programs in the journal. Not ready to join or subscribe? If you're not ready to join SARTS or subscribe to ARTS but you want to keep in touch, sign up to receive our email newsletter to stay up-t0-date with all of our calls and events. SARTS and ARTS are grateful for donations from supports who believe in our mission. If you are in a position to give extra, we will translate those funds into powerful programs at SARTS, excellent content in ARTS, and empowering fellowships for young scholars.